The inaugural Conference and Masterclasses were a great success, with over 120 attendees from cultural agencies around Australia and beyond. Click here for a special issue of M&GNSW’s publication the MAG, based on the conference findings. Update: since the Conference, the Cultural Ministers Council has committed to the development of cultural indicators to assist policy development. The Council released The Building a Creative Innovation Economy report which documents the growing contribution of the creative sector to the innovation economy and the digital environment. – brokering better partnerships in the creative sector. The Social Media and Cultural Communication Conference 2008 was presented by the Australian Research Council Centre of Excellence for Creative Industries and Innovation; with the support of Museums & Galleries NSW; the Historic Houses Trust of New South Wales; the Museum of Sydney; and the Australian Museum. Read this blog for further information on the Digital Cultural Communication 2009 event. 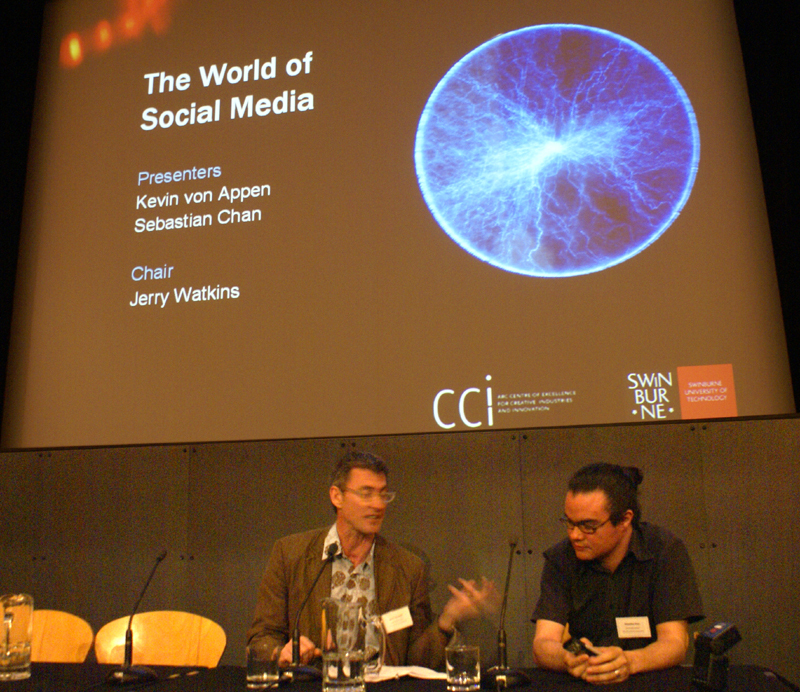 Leading web exponents Kevin von Appen and Seb Chan presented a world tour of current best practice in social media and cultural institutions. – What do we value? – What are we looking for? – How do we measure it? Social media are hard! Engaging with social media means that we need to make strategic choices about how we’re going to collaborate, recombinate. Web sites are becoming web applications; web visitors are becoming users and forming communities. Visitors talk about us – the new way, they blog about us, they talk to each other and visually communicate experience to their families. They share these images or put their own videos up. Your visitors can find it! Is it a threat to ignore? Is it an opportunity to change? Visitors describe their visit to the museum in ways which are different to the ways we want them described, or the way that curators or marketers might describe them. Social media are not cheap – resources increase and change; community / persona managers need to be developed. If your community strategy is right, the community will respond and continue the discussion (see Sydney Observatory). An active community will reduce resource requirements as they will maintain conversations around your content, but you need resources to make communities emerge. Verification and follow-up require resources. Can social data work for museums? e.g. the SAATCHI Gallery is of value because you can see what people are looking at. This expert panel discussed how social media can provide powerful tools to enhance connections with learning communities. Majority of adults who visit museums have higher education. Overwhelming interest in content and the visual aesthetic. Data suggests that those who visit museums are engaging in two-way communication. What will museum visitors bring in their physical visits? Museum 3.0: does the physical space engage the physical and the web environment the intellectual? Authentic learning experiences, both online and physical. Engage personal and social behaviours of students, and encourage interdisciplinary skills. Tim talked briefly about the Learning Federation / Museums and Collections Online. This pilot project seeks to develop a standard mechanism process for museums to feed content in the correct formats into state learning systems. We have good solid information about social media approaches, why is it so hard to get involved and engage with museum audiences/ visitors/ users/ – what is the fear? Library of Congress has put 3500 record items on Flickr and asked users to help to help catalogue them. Educators are worried about how to engage the ‘new learner’. They require goals that incorporate defined tasks and expectations, activities which engage technology, collaboration and teamwork, equality in treatment. Museum programs do not necessarily take this ability to work together in the programs which they create. New generation learners think differently – they multi-task particularly well between ideas and concepts – but the downside is that they don’t remember things particularly well. But this is ok because we need to know how to find information – how to search – rather than retain information. So why are educators having problems? Students are changing, engagement is changing, and exposure to content is unprecedented. Students are downloading and exchanging content. Brett showed an extraordinary example of animation created by two 15-year old students to highlight the profound results which can be achieved in informal learning environments. This high-level round table debated whether social media can or even should evolve the business of museums and libraries. Can the authoritative cultural voice be extended and maintained by wider popular engagement? What part will social media play in the twenty-first century institution? These CEOs and senior managers are active participants in ongoing research projects by the Co-Chairs in digital cultural communication in cultural institutions. Lea highlighted the Queensland Memory project, an actual and virtual site where Queensland identity, culture, history and information is stored, created, celebrated and shared. Aboriginal and Torres Strait Islander cultural assets and knowledge form a vital part of Queensland Memory. To facilitate creation and development of these assets and knowledge the State Library has developed Keeping Culture Strong, a cultural heritage project which uses new technologies to facilitate greater access for Aboriginal and Torres Strait Islander communities to information and cultural heritage. The concept of the ‘4th’ Museum is central to the aspirations of Keeping Culture Strong. This initiative builds capacity within Aboriginal and Torres Strait Islander communities, allowing communities themselves to meet and manage their own cultural and knowledge assets. The following projects are examples of how Keeping Culture Strong enables cultural interaction to be re-imagined. – On-line Indigenous Language Resources: this project provides online resources for Indigenous communities across Queensland. Training in digital recording and digital standards has also been delivered to remote Indigenous communities to enable further development of on-line recorded resources. – Virtual Books for Children: one of the outcomes of the Indigenous Language Resource project has been the development and on-line publication of bi-lingual virtual books. Created by both children and adults in Aboriginal and Torres Strait communities, these books have been digitised and made available on the State Library’s website. Pages can be ‘turned’, aspects on the page can be enhanced and some of the books have downloadable recorded audio. – Margaret Lawrie’s Myths & Legends publication: this project will digitise the work of anthropologist Margaret Lawrie who recorded the myths and legends of the people of the Torres Strait. Another project will produce a virtual book. iI is envisaged that communities originally depicted in Lawrie’s work will develop an on-line publication and create social media material that can be discussed and shared. – Our ambitions for social media and our capacity to be agile with such new forms of communication and engagement will always be tempered by the historical trajectories of our institution and the extent to which we can imagine our futures. The museum needs to stop being the “authoritative voice”; historically we have tended to speak to (or at) audiences, now we need to engage in dialogue, debate with them, or provide places for them to debate each other. We need to establish debate forums in places and ways that suit the interest groups we seek, not in ways that just suit us. The booming area of social media offers us the huge opportunity of new forums, and access (potentially) to a wide range of interest groups, either through our own websites or third part sites such as Facebook and YouTube. To take advantage of that we need to let go of some (or all) authority. The Cooper Hewitt National Design Museum has a very small proportion of its collection online. Due to its national mandate to reach out and educate the nation about the value of design, it has developed cultural interactions which cross-boundaries from the traditional museum ‘through the door’ visitor to young people who have very little if no connection with the museum. Reimagining cultural interaction via social media is possible because of the authority of the museum. Reaching out through social media initiatives creates new audiences. Outreach and interaction – 80% of the ‘through the door’ visitors to the Cooper Hewitt come from within a one mile radius of their museum. Yet the museum’s mission is to reach people across the country. Strategic social media initiatives enable cultural interactions previously unavailable to the museum. The final session summarised the main findings from the conference and used these to explore new directions in social media. The current open source, online community is proving that utopian ideals and passion for social, political and artistic change is continuing on the Internet. Like all counter-cultures it is challenging the status quo and attempting to free up culture for access, distribution and debate. The use of ready-made found material has also been strongly embraced by this new counterculture as content for sound and image mash ups. The social and political movements driving the push for Creative Commons licensing, open source access and user led input are akin to the libertarian spirit of earlier avant-gardes. The advent of the Creative Commons license is a subset of this movement and is again asking borderline questions about what are our rights to be able to engage, play and utilize our own culture as a ready-made? – Picture Australia: People, Places and Events’ group is seeking images of social, political, contemporary and or historical events of national significance. Kevin showed an image of an exhibition produced 12 years ago – about the Internet!! Damien rought a ‘grounded view’ of social media from the commercial world. – Focus on those social media areas which are financially viable. How do we mix the old and the new – and should we care? – Integration of ‘old world’ distribution in the commercial world is a big issue. – Change management is the biggest issue. – Is it serving a niche or serving volume? – How do we collaborate to come up with new collecting models? – Social media – are they still media-specific? Congratulations to all concerned for last week, a great few days, especially Friday’s conference. Hi Thanks to all for the “grand meet” it was extremely useful to me in our current “refresh” of the QM website. Following up on the “theme” of federation and sharing initiatives in some institutions, especially nationally, (Picture Australia). I thought the demo of the idea and functionality of Europeana: connecting cultural heritage. Not so much for the technicality but the venture of cross country/institution initiative. More details regarding the initiative: Creating Cross-Domain Consensus for the European Digital Library Consistent with the i2010 digital library initiative, this thematic network will build consensus to create the European Digital Library. It will find solutions to the interoperability of the cultural content held by European museums, archives, audio-visual archives and libraries in the context of The European Digital Library.” By the way you must see/hear the boot video! It would be great if Galleries, Libraries, Archives and Museums could all cooperate across sectors on such a national initiative or for that matter globally. I understand with our individual budgets it is had to gain momentum/focus on the national, so interested in a nationally funded initiative. I have lost track of where GLAM is with the Digital Summit recommendations from late 2006. Maybe it is already happening! I would like to hear of other national cross sector initiatives. This masterclass by Kevin von Appen – Associate Director of Daily Experience Operations at the Ontario Science Centre – invited participants to imagine new possibilities for social media inside their own organisations, using the Rapid Ideas Generation technique. Participants collaborated to select a program, exhibition, collection or program from one of their organisations, and extend or recast it using the tools of social media. The groups exchange initial proposals for a second round of ‘re-works’ to refine ideas. Hi Kevin, Thanks for the session today. For me the biggest challenge was working in 3D. I find that ideas usually come fastest with pen in hand. I also thought that some of the stories seemed to be created around, or tried to legitimise, the use of particular props. Would love to have heard more at the seminar tomorrow, but unfortunately it’s completely booked out. Feel free to drop by the Gallery if you have any spare time. Big fun session this morning – excellent. As an archives person I wondered how it would go, being in a group of museum and library people and trying to come up with ideas that worked across all these different types of collecting institutions. But I agree with Kevin’s idea that RIGs are good for the big picture thinking, and at that level the details of implementation and particularity really don’t matter. The vision is paramount, and a vision is something that anyone can appreciate. For me, wanting to inspire institutional change, that was a useful understanding to come to. Glad it was good – for those who weren’t there (like me!) a reminder that RIG stands for Rapid Ideas Generation. Seems a really useful way to get feedback in a creative and fun way. I know that those I spoke to really enjoyed it. Hi all: Thanks for the kind words and constructive comments – I’ve also observed that sometimes the “prop” can guide the idea in a RIG, mostly that’s helpful in suggesting unexpected directions, but sometimes it does get in the way ie “So, what can we say about these cute stuffed koalas that we grabbed simply because we like stuffed koalas”? I found the groups in both sessions yesterday remarkably flexible, creative and willing to take risks (even when those risks involved illustrating an “explosion” of ideas by throwing pillows in the air or pouring leftover tea into bowls of water to show how visitor contributions through social media can enrich a museum’s offerings. Happy to follow up in more detail about the physical experience of the Weston Family Innovation Centre anytime, Molly, either through this blog later or in more detail if you want to contact me direct. In the meantime, thanks again for yesterday, guys. Aussies rock! Thanks to everyone who participated in the masterclass. Each time I went into the room I was reminded of the value of ‘making’, particularly as it provided such a great networking opportunity! We’ll be uploading images and podcasts over the next few days and I hope these too are of value to you! This masterclass by Caroline Payson described how the Cooper Hewitt National Design Museum’s online Educator Resource Center has provided a testbed for creating and sharing knowledge. Caroline provided pointers for any organisation seeking to build its own online communities. This session attracted a great range of professionals interested in the use and value of social media in cultural communication. One of the highlights was the clarity with which Caroline described the educational strategy of the Educator Resource Center initiative, how this has evolved over the past 18 months, and the traction it has received within the education, design and funding community. Thanks for that Cath! Yes, the organisational change issues were certainly intriguing to us all!! I hope you get a chance to become a member of the Educator Resource Center – it is a great resource. Thanks to Caroline for such an insightful session. As a design education officer at the Powerhouse Museum, I was highly interested in the ways in which The Cooper Hewitt has become such a strong resource for design education not only in America but world wide. As a former Design and Technology teacher I think it is an innovative and effective way to generate learning content for the Museum through utlising the knowledge base of design teachers nationally. I really enjoyed both days and the opportunity to hear stories from such a cross section of people. Kevin von Appen is Associate Director of Daily Experience Operations at the Ontario Science Centre. He directs the Centre’s internet initiatives, publications, science writing and translation, and knowledge management. He has developed creative web-based projects for AOL Canada, Sympatico.ca, MSN – Microsoft Network, Bell Emergis and Canoe.ca. Sebastian Chan is Manager of the Web Services Unit at the Powerhouse Museum. He has a background in social policy, journalism and media criticism as well as information technology, and has been building and producing websites and interactive media since the mid-1990s. Fresh+New – digital media in museums blog. Kerry Cody is Head of Information Management and Information Technology at Queensland Museum where she is is currently coordinating the redevelopment of new media services. Louise Douglas is General Manager, Audiences and Programs at the National Museum of Australia. Louise has worked in cultural heritage management for 20 years at senior and executive management levels at both the Powerhouse Museum and the National Museum of Australia. Lea Giles-Peters is State Librarian at the State Library of Queensland. Previous positions include Director, Northern Territory Library and Information Service; Assistant Secretary, Northern Territory Department of Housing and Local Government; and Manager, CSIRO Library Network and Information Services. Fiona Hooton is Manager of Picture Australia, an online pictorial database hosted by the National Library of Australia. Fiona has worked as an artist, educator, community worker and arts administrator. Dr Lynda Kelly is Head of Audience Research at the Australian Museum. She has extensive experience in planning and conducting quantitative and qualitative research for a variety of programs and clients. Brett McLennan is Screen Education Manager at the Australian Centre for the Moving Image (ACMI). His portfolio covers ACMI’s screen education programs, which includes the oversight and alignment of ACMI education programs to both ACMI core business and current and future government initiatives. Caroline Payson is Director of Education at the Cooper Hewitt National Design Museum, a Smithsonian Institution in New York. Payson has an extensive background in arts education, and was formerly Director of Educational Services at Maryland Public Television. Carolyn Royston is Project Manager of The National Museums Online Learning Project, a significant new partnership involving 9 UK national museums, led by the Victoria and Albert Museum. 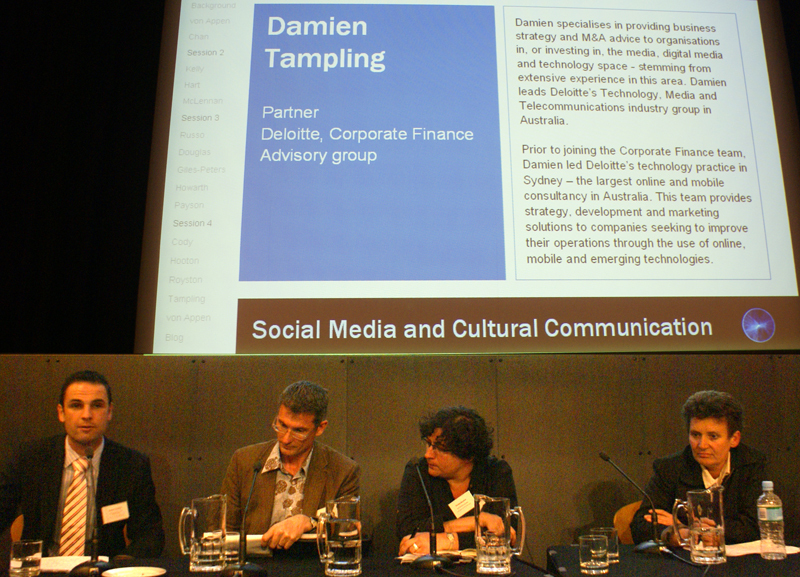 Damien Tampling is a Partner in Deloitte’s Corporate Finance Advisory group in Australia and specialises in providing business strategy and M&A advice to organisations in, or investing in, the media, digital media and technology space. Damien leads Deloitte’s Technology, Media and Telecommunications industry group in Australia. Jerry Watkins has a 20-year track record in commercial communication design and multimedia production. He has provided creative consultancy to some of the world’s leading brands. He is a researcher on the projects New Literacy, New Audiences and Engaging with Social Media in Museums at Swinburne University. Thanks for this great event. I am a 28 year old female working in lending and reference services and on the Emerging Technologies team at a regional public library. I feel fairly comfortable in the new world of social media, and hope best practice is taken up by the cultural services industry to broaden delivery, build online communities and market services/collections. I am thrilled and inspired to take some ideas and ‘how tos’ back to my team. 1. Access. ABS says “…46% of households were using the Internet at home by 2002. However, there are substantial differences in levels of access between different groups of the population”. Working in a public library I see this everyday. Who are we ignoring? What about the ‘have nots’? Lea’s brief comment on the panel on Friday about ‘abolishing reference services’ brought this home to me. 2. Quality. A lot of what I see on the web is great. A lot is narcissistic “pseudo communication” between avatars (v real people) -many of whom aren’t well informed but all of whom are opinionated. (Thanks Brett for the Duchovny/Rollins clip). Does this matter? I think so if what we are trying to do is build real communities. The rampant individualism dominating the www is a problem for me – my job is to locate and direct others towards *quality* resources. 3. Digital overload. What about the tangible world? The online world is a little disconnected from reality. My everyday life is quite disconnected from my virtual self. The rows of people sitting in the public library accessing our www pcs aren’t looking at or talking to *each other* – and many of them are members of the same family! The reification of Web 2.0 has me a little worried. I would hate for second life to become first. Thanks for such a thoughtful response to the conference. It’s great to see that the library you work with has an Emerging Technologies team. This is very encouraging for the sector!! Access remains a driver for both digitisation and the use of social media. While digitisation has its own complexities and is often discussed within the context of national standards for collection, registration and access, social media is a relatively small bandwith exercise. Social media software is open source and the user interfaces are particularly good. We see social media as a mechanism through which to draw audiences to cultural institutions. For those without access at home, social media provides a simple tool which can be used within public places. We’re waiting to see how the statistics change over time. Jennifer Trant talks about creating ‘trusted cultural networks’ – a situation where cultural institutions themselves take a proactive stance in linking together to provide authoritative information. The Musuems Online Learning Project in the UK which Carolyn Royston talked about is an excellent example of this. Pseudo communication and narcissism will always be around and we can’t do anything to stop that, what we can do is promote genuine networks around cultural knowledge exchange -something our organisations are expert in! I get a reality check whenever I watch teenagers who have access to the internet and mobile phones simultaneously. They can msn, text, make phone calls, download videos, listen to music and talk to others in the ‘real world’ with them simultaneously. They might not do any of it particularly well but their primary objective is communication. I am always encouraged by this need to seek out others and exchange knowledge. Perhaps those early images of kids playing computer games on their own were more indicative of disconnection from the real world but even these are now networked. Perhaps ‘remote communication’ will continue to evolve as another form of communication in our daily lives. Perhaps over time we will come to see this as a more natural extension of our desire to communicate! Please feel free to let us know how the Emerging Technonologies team goes!